Offering you a complete choice of products which include identity card for colleges. Our firm is counted amongst the leading manufacturer and supplier of the best-in-the-industry array of Identity Card for Colleges. 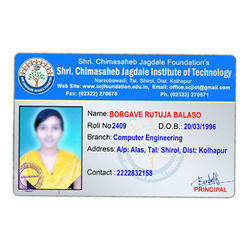 The Id cards are made using the best grade raw material thus, making these look attractive. These cards are properly prided with the details of the students with a photograph. The printing work is done at our in-house unit by making use of advanced machines. We have been making ID cards for a large number of colleges. Looking for Identity Card for Colleges ?